“Let There Be Love.” Music by Lionel Rand, words by Ian Grant. 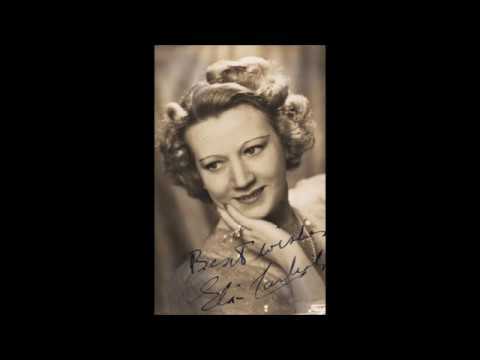 Recorded by Elsie Carlisle under the musical direction of Jay Wilbur in London on May 22, 1941. Rex 9989 mx. R5782-2. The output of songwriters apparently known for little else, “Let There Be Love” has exhibited unusual staying power, with a notable artist reviving it every decade or so: Nat King Cole (1961), Rosemary Clooney (1992), Cliff Richard and Matt Monro (2006). Bruce Forsyth even sang it as a duet in 1976 with Miss Piggy of Muppets fame. For the sake of full disclosure, I should mention that I do not like this song, and that Elsie Carlisle’s version of it is my least favorite of her recordings. Some of my objection to it must stem, no doubt, from simple matters of personal aesthetic sensibility. I find the rhythm of the beguine moderately irritating: it is to dance genres what a cloying, fruity blended drink is to cocktails (I am referring to the kind with a paper umbrella in it). All the same, 1941 saw Elsie Carlisle release a recording of another beguine, “You’re in My Arms,” which seems in every way preferable to me. And let there be me. The blessing-sneezing moment is no doubt the most carefully thought-out part of the lyrics. “…[O]ysters / Under the sea,” for example, only rhymes and does not contribute to a love theme, but “Someone to bless me / Whenever I sneeze” is a preconceived notion that the lyricist actually had to work to put into words — it is not there simply for the sake of rhyming. Noteworthy 1940-1941 American recordings of “Let There Be Love” are those of Sammy Kaye, Kay Kyser and His Orchestra (v. Harry Babbit), Maxine Gray, Shep Fields and His Rippling Rhythm Orchestra (v. Hal Derwin), and Jimmy Dorsey and His Orchestra (v. Bob Eberly). The song was recorded in Britain by Ambrose and His Orchestra (v. Anne Shelton and Sam Browne), Joe Loss and His Band (v. Bob Arden and Bette Roberts), Victor Silvester and His Ballroom Orchestra, and the Savoy Orpheans (dir. Carroll Gibbons, v. Anne Lenner).